Mr Roy, Mr Frank & others sent dire emails with evidence to Members of the BC Legislature, of which not one responded to Mr Roy or Mr Frank, but someone on this email list sent this dirty heads up warning email to Vancouver School Board. 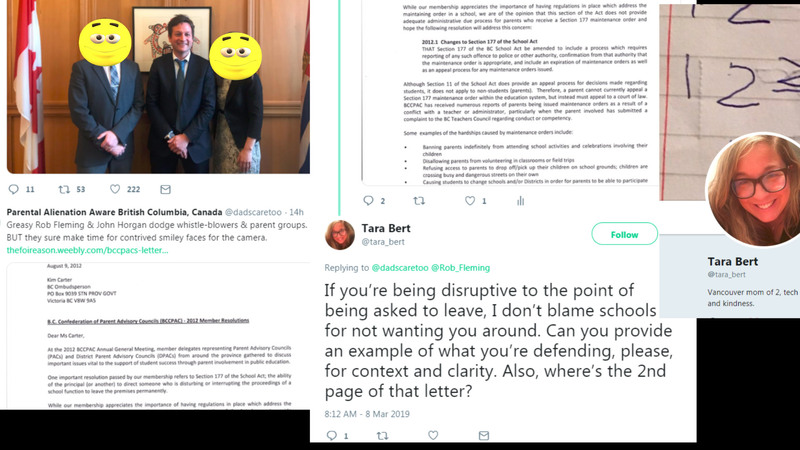 Vancouver School Board trustee Patti Bacchus(a very powerful loud mouth politician) used her Twitter account to attack a Sec.177 whistle-blower after taking direction from VSB Superintendent Steve Cardwell. Patti would be aware that Sec.177 had been used over 100 times at the time of her nasty Twitter Tweet on behalf of VSB management. Patti's Tweet was designed to paint parent(s) as dangerous when he was not & to minimize Sec.177 law. VSB that did not want parents talking to news media about Sec.177 corruption (Sec.177 was being used widely throughout the public school system to intimidate parents & children from reporting abuses by school staff & management). See documents. After the VSB attacked Mr Roy with a BC Sec.177 for talking to news media about the violent school principal who used school letterhead to write a malicious letter that caused untold emotional & financial harm, the VSB became alerted that the scandal had hit the front page of the Georgia Straight Newspaper. Patti Bacchus immediately contacted Steve Cardwell to warn him that the VSB Sec.177 scandal had been exposed ! For the record, trustees are hired to keep a watchful eye on school boards & not be conspirators in working against whistle-blowers. Not once did Patti Bacchus or Steve Cardwell ( according to hundreds of FOI documents) ever show any sign of having a moral compass, as their only focus was to insulate each other & lash out against parents(whistle-blowers). PDF FILE DOCUMENT #6 Bacchus warns Cardwell scandal hits news paper ! VSB superintendent Cardwell shares a disturbing thought with the powerful loudmouth school trustee Patti Bacchus knowing she would " just so you are aware of who we are trying to provide relief " . Again, out of the hundreds of FOI documents, neither Bacchus or other staff question Cardwell as to what the school principal did or if attacking Mr Roy with Sec.177 was moral or even legal. PDF File "just so you are aware of who we are trying to provide relief"
Vancouver school system freaking out because "The Mayor" has been informed of the BC Sec.177 legislative law corruption scandal ! Why ? Hmm..
Parents & whistle-blowers attacked with Sec.177 were often not on school grounds, so why do the Tara Bert's knowingly cause further harm by spreading false innuendo ? Hmm..
PDF File #2 He told the Mayor !!!!!! !